Kathmandu - Pokhara 5 days’ tour is one of the best tours to observe the culture and natural beauty. Kathmandu is the cultural city and Pokhara is naturally beautiful city where we can have the panoramic view of snow-capped mountains, beautiful lakes like Phewa Lake and Begnash Lake. David’s Fall is really interesting waterfall in Pokhara. The Mahendra Cave, Gupteshor Mahadev Cave and Chamere Gufa (Cave) are amazing in Pokhara. Day 01: Pick up from airport and drop to hotel. Day 02: Mountain flight. Breakfast, sightseeing in Bouddhanath stupa , pashupatinath and Bhaktapur. Day 03: Break fast. Drive to Pokhara and boating in Phewa Lake. Day 05: Fly back to Kathmandu international airport and from there fly to onwards destination. Day 01: Pick up at the airport and transfer to hotel. Day 02: Early in the morning drive to domestic airport for mountain flight to view the World highest Peak Mount Everest as well as hundreds of snow peak - back to the hotel and breakfast - tour to Bouddhanath world’s biggest Stupa - drive to Pashupatinath which is the beautiful pagoda temple with hundreds of pilgrim each day. Tourists can view the Baghmati River which is very popular and important for the cremation. Drive to Bhaktapur, the traditional city of Kathmandu, where tourists can see the old royal palace with group of temples, pottery square and handcrafts. Drive back to hotel. Day 03: Breakfast-drive to Pokhara. Lunch is provided in a beautiful restaurant on the way to Pokhara. The whole road passes along the mountain and just down the road. Visitors can view the beautiful rivers. Boating in Phewa Lake. Day 04: Early in the morning drive to Sarangkot to view sun rise and beautiful snow mountains-drive back to hotel-breakfast-start sightseeing and visit Bindebasini temple, Devid’s Fall, Gupteshor Mahadev Cave and Tibetan Refugee Camp and back to hotel. Farewell dinner with Nepali cultural programme. 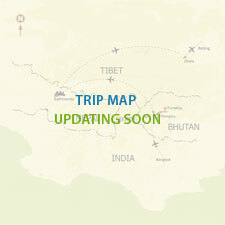 Day 05: Fly back to Kathmandu and drop off at the international airport to departure for final destination.